The Coastal Resilience network supports a community of practitioners around the world who are applying planning innovations to coastal hazard and adaptation issues. The network provides access to peer practitioners, tools, information and training focused on nature-based solutions in a consistent and cost effective manner. Global: The Global Coastal Resilience tools provide support for decision-makers working at national and multi-national scales in assessing where to act in risk reduction, adaptation and conservation. They build from critical resources such as the Global Platform on Risk Reduction, World Risk Report, and Conservation Atlas. Caribbean: The impacts of climate change are increasingly seen across the Caribbean basin, a region where densely populated often low lying coastal areas are threatened by hurricanes, as well as rising warmer oceans. Given the high dependency in the Caribbean on natural resources for livelihoods, a focus on ecosystems and their interaction with people is essential for climate change adaptation. Our work in this region is focused on helping communities and government increase their resilience to climate change by protecting, restoring and sustainably managing their marine and coastal systems and strengthening local capacity for adaptation. United States: The US Coastal Resilience tools provide support for decision-makers working in the continental US identify solutions for risk reduction and conservation. They build from critical resources provided by many groups and agencies including NOAA, USGS, FEMA, USFWS, TNC and the Natural Capital Project. Gulf of Mexico: With its high incidence of storms and hurricanes and valuable ecological and economic resources, the Gulf region is a high-risk area with great potential to demonstrate natural risk reduction solutions. The Coastal Resilience approach and tools have been applied Gulf-wide and at specific sites, including those that help identify where to implement oyster reef restoration to meet social and ecological goals. Oyster restoration demonstration projects with partners like the National Oceanic and Atmospheric Administration (NOAA) and Army Corps of Engineers (ACOE) creates a strong base for replication and scaling-up to larger projects. U.S. East Coast: The northeast coast of the United States is among the most heavily developed in the world. Much of this coastal property is only inches above existing sea level, putting billions of dollars in public and private funds and business at risk. Coastal wetlands and other ecosystems provide habitat, natural buffers from storms, and other natural benefits, are also at great risk of loss due to sea level rise. U.S. West Coast: The goals of West Coast Coastal Resilience are to: 1) improve our understanding of how climate change will impact coastal and floodplain areas; 2) combine social, economic and ecological data with future climate, fluvial, and, coastal hazard scenarios in an interactive, online decision-support tool; 3) work with local decision-makers to explore alternative climate change and disaster mitigation approaches, focusing on nature-based solutions; and, 4) provide floodplain managers with tools that integrate climate change and hazard risk information with strategies that advance flood reduction and habitat restoration goals. These apps are intended to cater to the needs of stakeholders, policies and planning processes. These apps can be used to simplify complex relationships or models, convey a specific ecological or social concept, or used to compare different future condition scenarios. Coastal Defense quantifies how natural habitats (oyster and coral reefs, tidal marshes, seagrass beds) protect coastal areas by reducing wave-induced erosion and inundation. It uses standard engineering techniques to help you estimate how and where to restore or conserve critical habitat, and increase the resilience of your coastal community and infrastructure. Flooding is increasing along the coast and certain rivers. 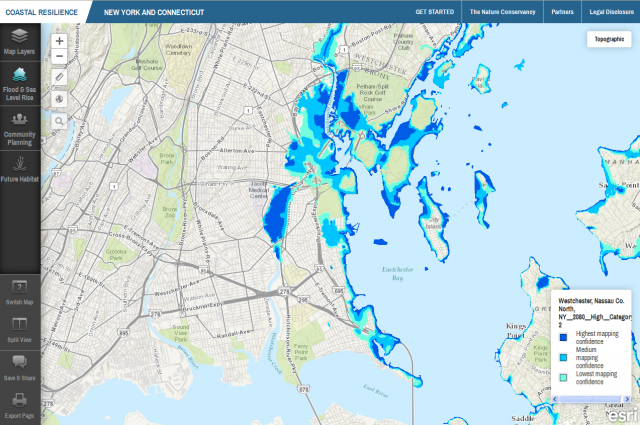 Use this app to view areas affected today and in the future due to increased sea level rise, surge from storms and hurricanes, and inland flooding. Certain ecosystems like coastal wetlands have the ability to move landward as sea level rises. This depends on several factors including the rate of land accretion or the amount of sediment accumulating in the coastal area, the rate sea level is rising, and whether or not there are physical obstacles preventing wetlands from moving landward. The Future Habitat app categorizes various tidal marsh advancement scenarios. The Restoration Explorer allows stakeholders to examine ecological and socio-economic factors for restoration suitability. In this app an oyster reef index was compiled for restoration scenario planning where individual factors can be weighted for importance when identifying potential restoration sites. The Risk Explorer is organized by state and permits users to easily visualize coastal hazards exposure, social vulnerability and overall risk. The app allows users to explore where people and properties benefit most from the risk reduction benefits provided by habitats. Coastal Resilience provides communities, planners, and officials with easy access to information to assist in coastal planning and management decisions regarding resources at risk from sea level rise and coastal hazards. This information is accessible through an interactive decision support tool. With the Future Scenarios Mapper, users can characterize current conditions and visualize the ecological, social and economic impacts of reasonable future flooding scenarios. There are several tutorial videos available to support user navigation of Coastal Resilience. NOAA is an agency that enriches life through science. Our reach goes from the surface of the sun to the depths of the ocean floor as we work to keep citizens informed of the changing environment around them. From daily weather forecasts, severe storm warnings and climate monitoring to fisheries management, coastal restoration and supporting marine commerce, NOAA’s products and services support economic vitality and affect more than one-third of America’s gross domestic product.